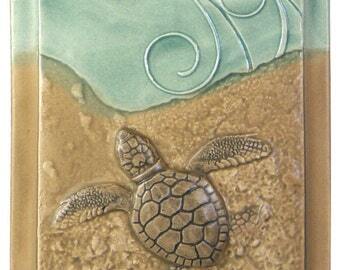 Handcrafted fine art tile and wall art. Announcement Welcome to a unique offering of highly detailed ceramic relief tiles. 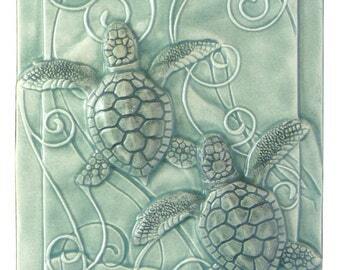 There's nothing like them anywhere else, art tiles aren't just for museums anymore. All pieces are created entirely in our studio (Medicine Bluff Studio). The focus of my work has been on creating affordable fine art. I used to produce my work in handmade paper but I wanted something more permanent, I found the answer in ceramic, an art medium that can last for thousands of years. 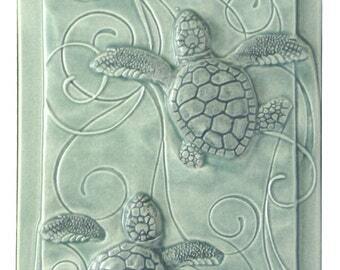 Each piece is made by hand using the same process that was used to make ceramic tile for hundreds of years. All of my designs are original from inspiration to the handcrafted intricate detail of the finished work. There is a cavity in the back of each piece so it may be easily hung on any wall, however they also make beautiful designs when installed or framed. Most of my art has a story or meaning behind it, sometimes quirky, sometimes inspirational. I hope you enjoy it for many years to come. 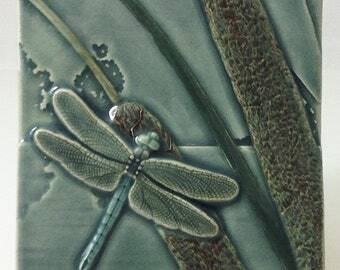 Welcome to a unique offering of highly detailed ceramic relief tiles. 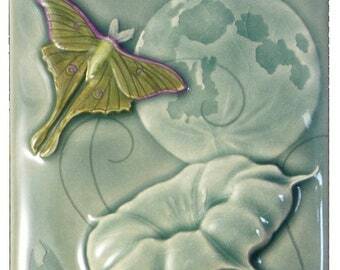 There's nothing like them anywhere else, art tiles aren't just for museums anymore. 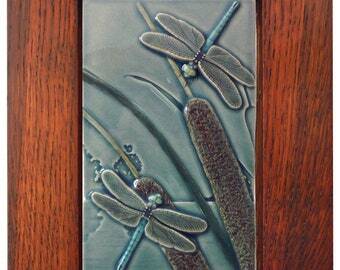 Double Dragonflies, 4x4 inch ceramic tile, two dragonflies with moon. Framed art tile, relief tile, framed ceramic tile, sculpted tile, Night Shift framed, 7 x 11 inches, framed wall art, framed home decor. 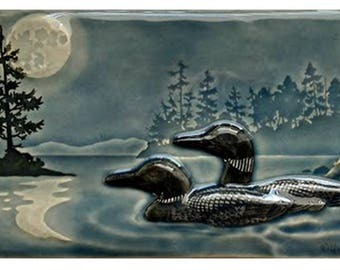 Ceramic sculpture, Moonlight Swim, wall art, Loons, relief sculpture. Wonderful detail. Wonderful muted colors. So, so beautiful. If I could give 6 stars, I would! Absolutely stunning. It brought a smile to my face and a tear to my eye. Gorgeous! If I could give 6 stars, I would! 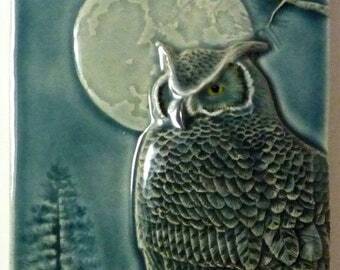 Decorative wall art tile, ceramic tile, Night Shift, great horned owl, tile, wall art, wall hanging, home decor. Beautifully profiled tile. Artwork is amazing! Absolutely love your work! The tile is beautiful! Little turtles actually look real! 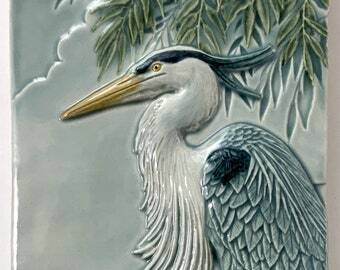 Ceramic art tile, "Taking it Easy", great blue heron 4 in. x 8 in. A long time ago in a far away land . . . In 2002 my design and sculpting job went over-seas. I had been making tiles by hand for some time and, with my partner, decided to jump into handmade tiles with both feet. Unfortunately I was making all my tiles of cast stone and the market was all about ceramic. That huge learning curve has been as conquered as much as possible, (with ceramic you never know everything), and all my work is now done in ceramic. I design and create every design in my studio then we go downstairs to our little shop where my wife and I make each one. We use the time honored method of pressing wet clay into a plaster mold that was made from my original sculpture. After bisque firing to make a durable piece of artwork that we can work with we will glaze it and fire it at least one more time. Each piece goes through many stages and we use multiple techniques to achieve the look I'm somehow getting known for. My original partner, now my wife, is the brains behind the studio, she makes sure everything runs smoothly and allows me time to do new designs. The name of my studio comes from Medicine Bluff, an actual bluff in southwest Oklahoma where we lived when we started the business on our porch. 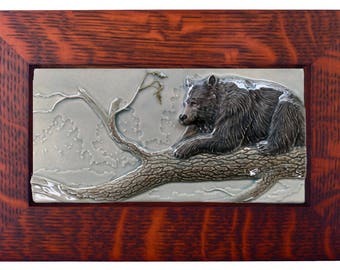 We also make sculpted designs that are used for installation in homes and businesses. Welcome to my ETSY shop! Art has always been a very big part of my life. All the stories that accompany my designs are from my life. I enjoy creating art that makes you smile, think, or hopefully both. I'm glad to have this chance to share my work with you, take your time and enjoy, and if you have any questions please don't hesitate to get ahold of me. 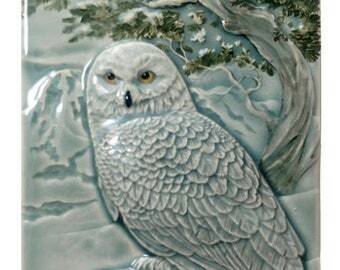 Ceramic artwork has been know to last for thousands of years so you should be able to enjoy it for a really long time. I have accurate descriptions of my artwork in the title & description for each design. If your order has shipped and you wish to return it I will gladly refund the purchase price upon receipt of the returned items in resellable condition. Shipping costs will not be refunded. If you receive my artwork and it's damaged please contact me immediately and we will take care of it. I want you to be happy with your decision to buy my work. I accept payment in U.S. dollars via direct checkout, Pay-Pal, or Etsy gift cards. If you wish to cancel an order you must do so before it ships. If you cancel before shipment (which can be very quick) you will receive a full refund. I generally ship through USPS priority mail. If you need your order to be shipped in a different manner it may effect the shipping cost and you need to send me a conversation with your requirements. For international shipping please send me a conversation about your order so I can get accurate shipping rates to your location. I can usually work something out and will try to keep shipping costs as reasonable as possible. Each individual piece of art work is going to be unique, no two will be exactly alike. They are made one at a time by hand. The designs are original and I sculpt each design. All my designs are safe for installation indoors as well as having a cavity in the back for easy hanging. They can be hung outside but don't install them outside due to the "freeze thaw" aspect of ceramic. If you have any questions please contact me.